Boundless Style is a “mix-and-match” pattern book: it contains the patterns and instructions for 5 bodices, 5 skirts and 5 sleeves, most of them with several variations, which can be combined to make a complete dress. Back when the book was announced, I had a huge crush on the few available pictures: the retro feel and unusual lines of the patterns seemed up my alley, and also I thought that the dress made from the Billy bodice was a shirtdress (but it’s not, it just has a collar, welp!). 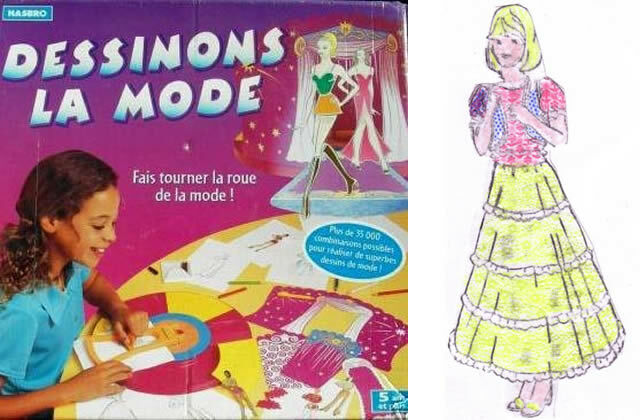 What led me to pre-order it was the online app, Lookbook, that lets you create dresses by picking the line drawings of the different parts; it feels just like this game “Dessinons la mode” that I was dreaming to own as a kid. I spent hours on the app imagining associations, and I was curious to find out if the actual patterns would meet my expectations. • The Jackie bodice, which features french darts, a very high neckline in the front and a low crossed back. • The Meryl dress, made up of six panels, the fullest skirt in the book (I wanted to wear it with a petticoat but forgot to pack it, too bad!). • The Grace sleeves, simple short semi-fitted sleeves. I made a size 4 based on the measurements chart, which was consistent with the size I used to make a Madeleine skirt from the same brand a few years ago. The book does not come with a pattern sheet. 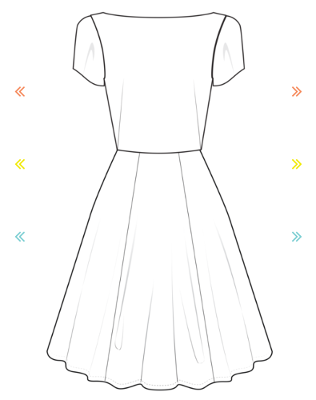 Instead, patterns are provided on a CD-Rom, with an individual pdf for each bodice, skirt and sleeve. Printing only what you need is a good idea in theory, so I was disappointed that all the variations of a single pattern came in the same pdf, instead of allowing them to be printed separately. In order to get the short Grace sleeve pattern, you have to print the 3/4 and the long sleeve as well, and that’s six pages that are going straight to the trash. I don’t mind that the patterns come on a CD-Rom, since apparently now you can download the pdfs online if you don’t have a CD reader, but it’s too bad to end up wasting paper and ink anyway. The book also contains instructions for each pattern: they tell you how to assemble each bodice, skirt and sleeve, and how to put all these together into a dress. Each step is illustrated with a picture (as opposed to a drawing). The instructions include things such as adding a waist stay, which is a detail I particularly like, especially with a skirt that has so much fabric. I didn’t have any problem putting together the sleeves and the skirt, except that it seems that Kristiann is addicted to stay-stitching. For instance, the book indicates to stay-stitch all of the edges of the skirt panels, except for the hem. Given that the following step is to sew the vertical seams to put the panels together, I’m really wondering if this vertical stay-stitching serves a purpose. The panels are not manipulated in the meantime, so doesn’t stitching the panels together have the same effect as the stay-stitching? Now that I think of it, I might have done better ignoring the instructions altogether… The fabric I used, a rayon challis from last year’s Gertie’s Jo-Ann collection, would have draped beautifully with the crossed-back. Unfortunately the gros-grain added to reinforce the biais edges pulls the fabric together somehow and makes the back waist seam ride up and stand away from the body in the most inelegant way. It’s a real shame because I think other than this the silhouette of the dress is great and the fit would have been spot on if I had just ignored the ribbon. I do like the low crossed-back. Unfortunately it is not very bra-friendly… or is it? I spotted these bra converters at Victoria’s Secret: elastic bands that you can hook to your bra and wrap around your waist to lower the back band. No need to spend $14 though: a piece of elastic, and old bra to cut into, and voilà! Here’s a tutorial if you need the same hack. I do like the finished dress: the fabric is wonderful, and the fit and shape of the dress are great and consistent with the line drawing. However, I have to admit that the book as a whole failed to impress me. I was very excited about the concept, the line drawings and the Lookbook app. Unfortunately I was really taken aback by the problems I ran into with the instructions and, honestly, by the pictures of the finished garments featured in the book. Yes, the photography is superb, but I find that the fit of the garments on the models is nearly always off, as if they were all one size too big, and there seems to be construction or sewing issues with some of the samples. That was very surprising, because up to now I had always found Victory Patterns’ samples to be impeccably made. I don’t see myself making another dress from this book anytime soon, but I’m still keeping it around just in case. In the meantime, I have also bought Gertie’s third book, Gertie’s Ultimate Dress Book, which is based on the same concept, and I’m curious to see how the two books compare! Thanks for a great review of the book, how on earth can you review a book without trying a pattern! The problems seem unforgivable to me. Having said that I do,love your dress. Your dress is gorgeous! I love the fabric, and the wrap at the back. What a shame about the book though, I hadn’t seen it before, but it’s sound like it’s very user friendly. well, i gotta say, i ADORE your dress! the fit on you is absolutely gorgeous, you’re making me want another! i did the jackie bodice too, but since i lined it, i didn’t run into the stay stitching SA difference. i actually tested a totally different combo of lookbook patterns before the release, and the fit was spot on there too. i’m curious to see how gertie’s patterns work out for you! Thank you so much! 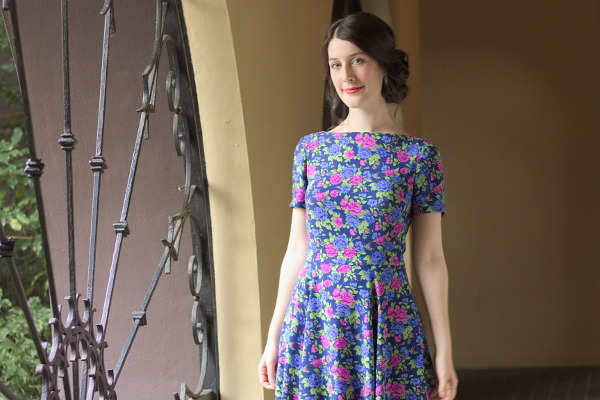 I really loved what you made with the Jackie bodice (and what a great idea to make separates!). Did you use a 5/8” seam allowance to line it then? I’m curious to know what other combination of patterns you tried if you don’t mind sharing! A beautiful dress in the end. I have the book, but haven’t made anything yet. thanks for such a thorough review. I will certainly study the instructions before I start. Your dress is beautiful! The low crossed back is so pretty – and thanks for the link to the bra converter, I’m definitely going to make one of those. I have this book but haven’t made anything yet. Luckily I don’t often read instructions anyway but that’s annoying that there are so many strange errors. you know, i’m curious what SA i used now, too!! i’m going to pull it out of “storage” (my cold weather closet is boxed up at the moment). i bet it was 5/8ths, because i’m always lowering necklines, that must be how i missed the staystitching SA. i do think i used twill tape, though–i have a faint memory of pulling out olive green tape, and thinking the color match wouldn’t be an issue with upholstery weight corduroy. HA. for the testing i did the georgia bodice +farrah sleeve. the result was great, but the fabric was super cheapo, just meant for testing. i’m thinking of doing the jackie + lydia next, if the armload of summer maxis i have planned ever get done! OOoh I’m looking forward to that! Thank you for this review! I have the book but am yet to try any patterns, I think because I still haven’t put the CD into my computer and because I really wanted to make a good job of it. This review will be really useful if/when I get around to trying any of the patterns. I agree with you about the look of the fit in the book photography. The lack of attention to detail and unnecessary printing does sound annoying. Anyway, your NOLA dress looks great!! And thanks for the bra tutorial, I definitely need to make that. Thank you for your always honest reviews! I’ve just found your blog and have been reading back in time. It’s very refreshing to read someone simply talk about what they do and don’t like without apologizing or twisting into knots to find a way to blame themselves rather than the pattern. Your dresses (including this one) are beautiful. I really enjoy your blog. This dress is lovely, and you look beautiful! I have the same fabric in my stash, and you’ve inspired me to get it sewn up. I’m glad! What are you going to make with it? Excellent review! The dress combination you’ve made is lovely. I’m currently working on my own version using Jackie, Moss, and Sophia. So, I’ll be taking your advice on the bra conversion. Thanks for the helpful comments! OH! I almost forgot to add: I totally agree with your thoughts on the models’ fit issue. The items are beautifully composed and styled, but the fit is terrible in several instances. I hate that, because it detracts from some gorgeous pieces. I know I had to do a small bust adjustment, because I’m an A cup…and the models appear to be AA or A. However, that hasn’t deterred me. I’m still planning on stitching up more from the book. I’d love to make a Jackie bodice with a peplum bottom, so I can pair it with jeans or pencil skirt. YES!